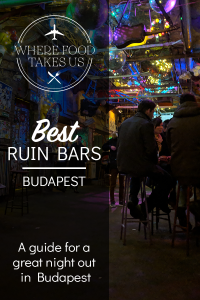 If you’ve ever searched anything like “what to do in Budapest” then you’ve probably stumbled across ruin pubs. 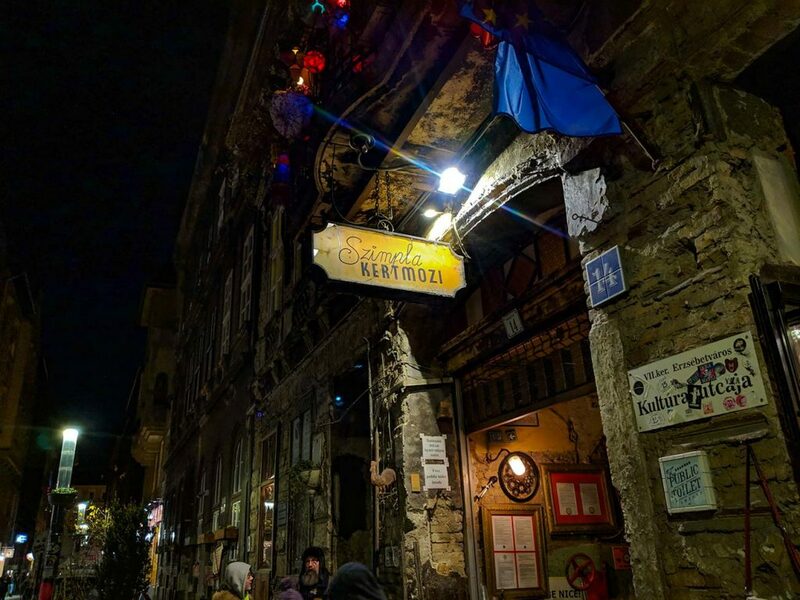 These famous bars are practically everywhere you look in the Jewish Quarter. Famous for being a Jewish ghetto near the latter part of World War II, the Jewish Quarter was abandoned and run down until the fall of the Soviet Union in the early 90’s. Privatization kicked in and some very smart artists began buying up property. It turns out that people liked to come hang out in these areas for the art. Then came the food and drink. The first ruin pub was opened in 2002. Today there are many of these ruin pubs for you to enjoy. 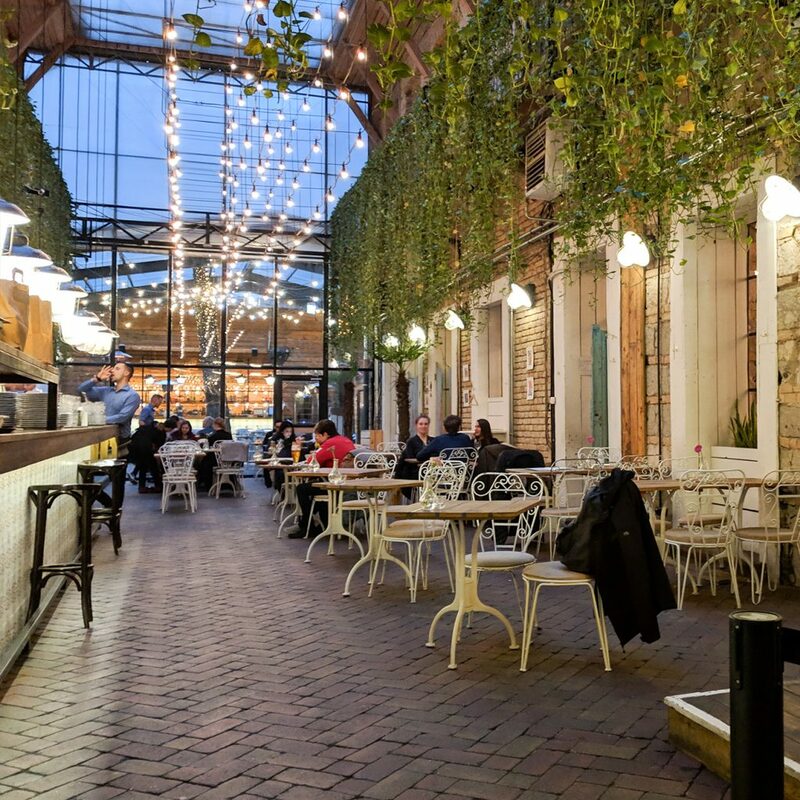 From old meat processing facilities and run down apartments, to any kind of building that was about to be demolished, you can find a ruin pub full of flare. 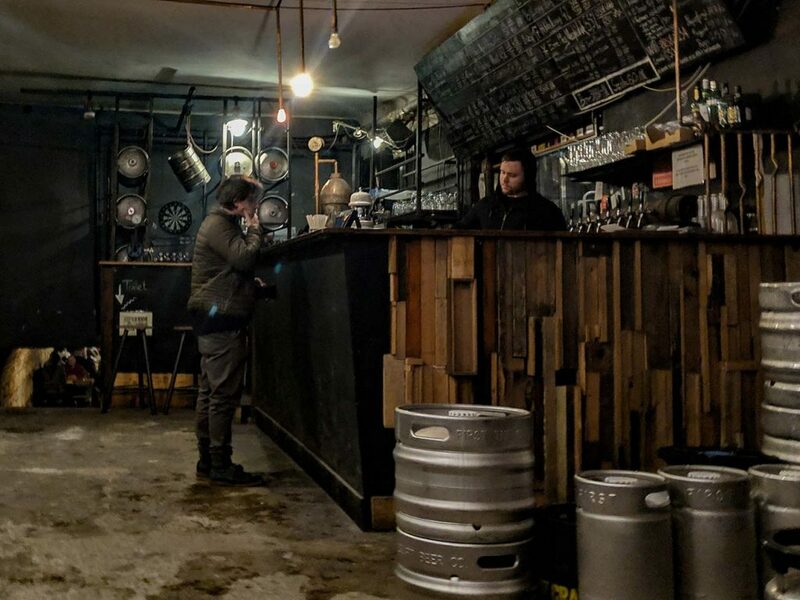 In this post we talk about the ruin pubs we visited during our time in Budapest. This is the oldest ruin pub in Budapest. 2002 doesn’t seem very old, especially when Budapest’s history dates back more than a thousand years. However, this ruin bar is less about its history and more about its uniqueness. It’s easy to get lost in this pub but that’s what makes this place so cool. The space is packed with “recycled” art and there are bars on multiple floors. Beer is more expensive here than at other places. However, that’s the case in most of the Jewish Quarter. A .5 L of cold lager will run you about $4-5 USD. To be fair, that’s still pretty cheap but it’s expensive compared to elsewhere in Budapest. 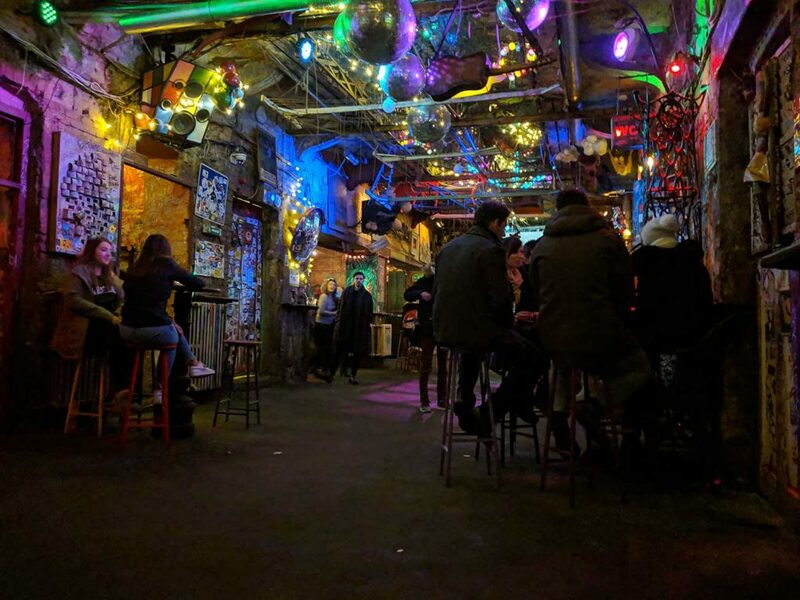 Szimpla Kert also serves as a cinema and performance space, whether that be concerts or theater. This is the most touristy ruin pub but don’t let that deter you. 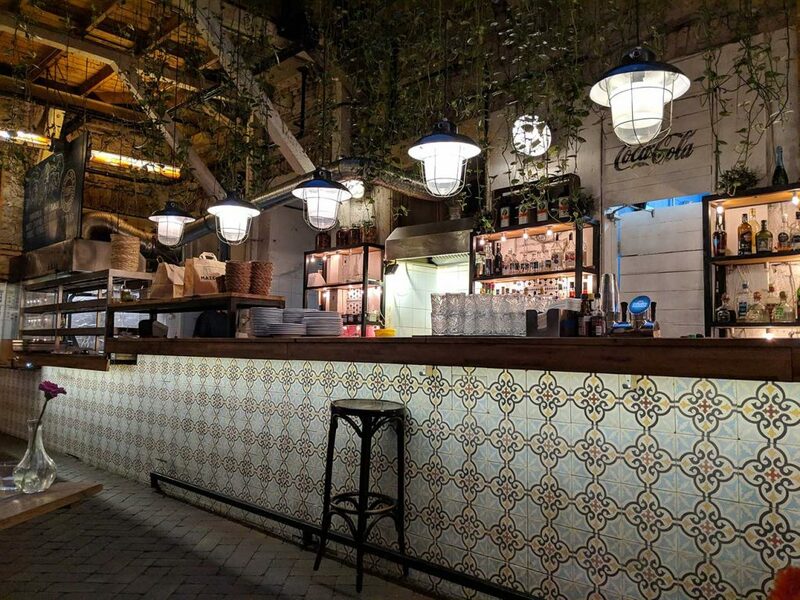 Being so large, Szimpla Kert has plenty of nooks to post up with a cold one and enjoy some friendly conversation. 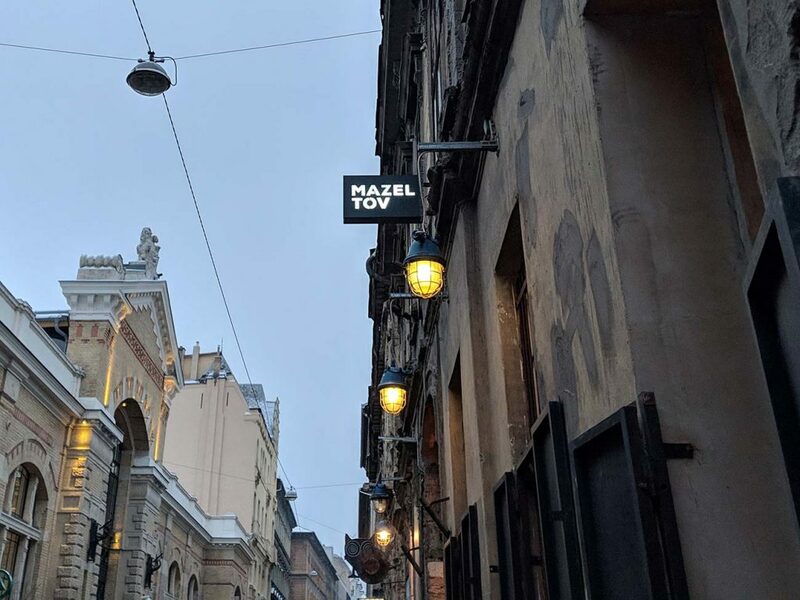 Also located in the Jewish Quarter, Mazel Tov is in stark contrast to Szimpla Kert. 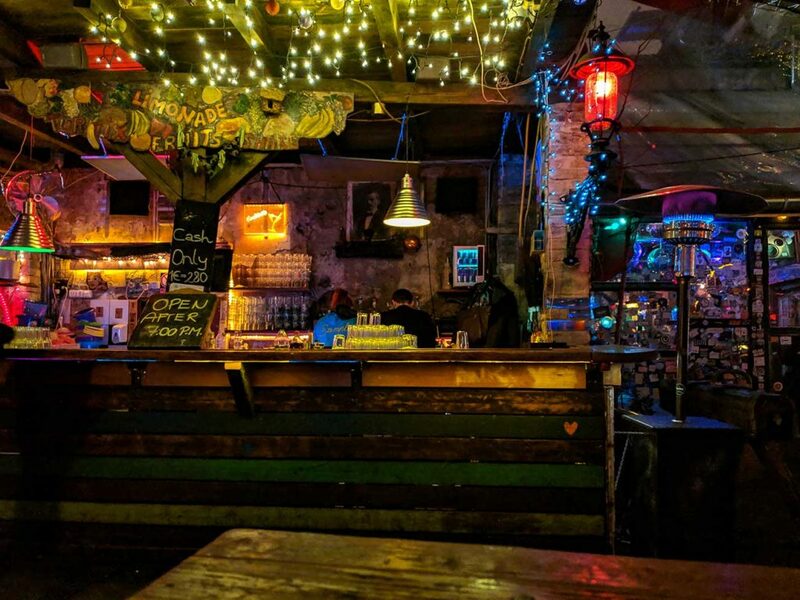 Szimpla Kert’s interior comes to our minds when we think of ruin pub because it’s the oldest and also the first one we visited. However, Budapest ruin pubs come in many forms! 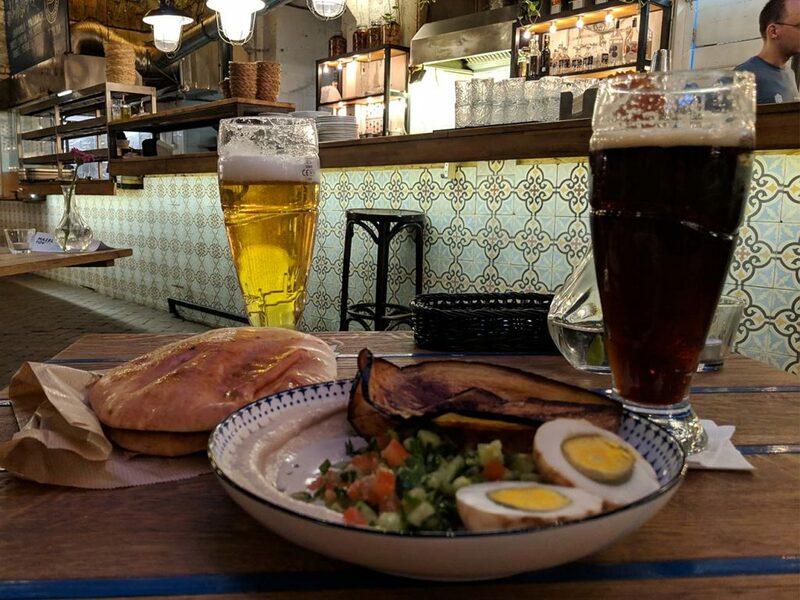 Mazel Tov’s drink menu is good, being priced similar to Szimpla Kert, but what makes Mazel Tov awesome is its delicious cuisine. It’s a kind of Israeli and Mediterranean fusion. We tried the fried eggplant hummus with peppers and it did not disappoint. Come for the chill, green-minded atmosphere and enjoy some creative cuisine. If the weather is right, try to time your visit around a garden party. The greener the merrier! They’re dog friendly as well! First off, let us say that we think this ruin pub could be really awesome. Our experience was less than okay. In Ellátó Kert’s defense, we were there early in the evening before the vibe really picked up. The place is massive. 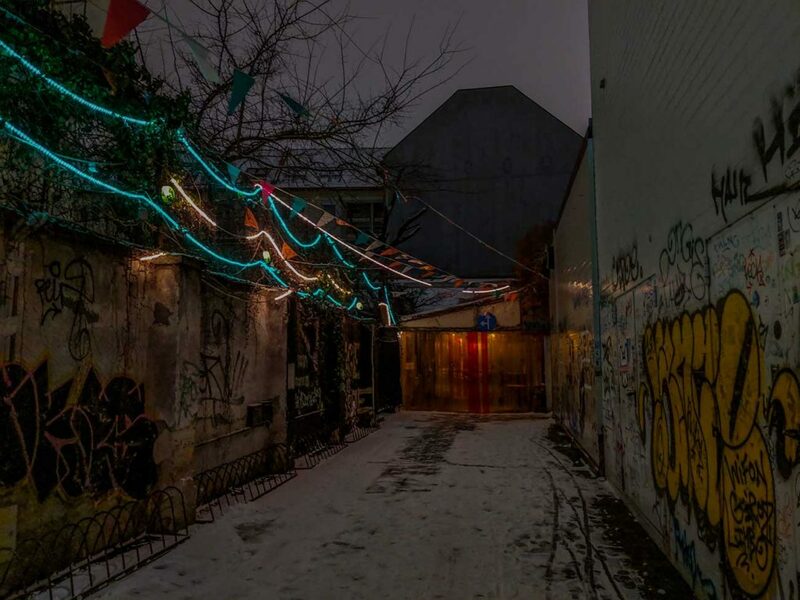 It’s similar to Szimpla Kert except there’s a lot less neon going on. You can find Ellátó Kert just down the street from Szimpla Kert. Open air seating outside or comfy couches indoors, you have your pick! Visiting in January, we obviously sat inside. You can also try your hand at some pool or foosball. Ellátó Kert is a ruin pub but it’s also a taqueria. You can find the small kitchen by walking all the way to the back. We tried the “nachos” but it was just tortilla chips and a big cup of dip. 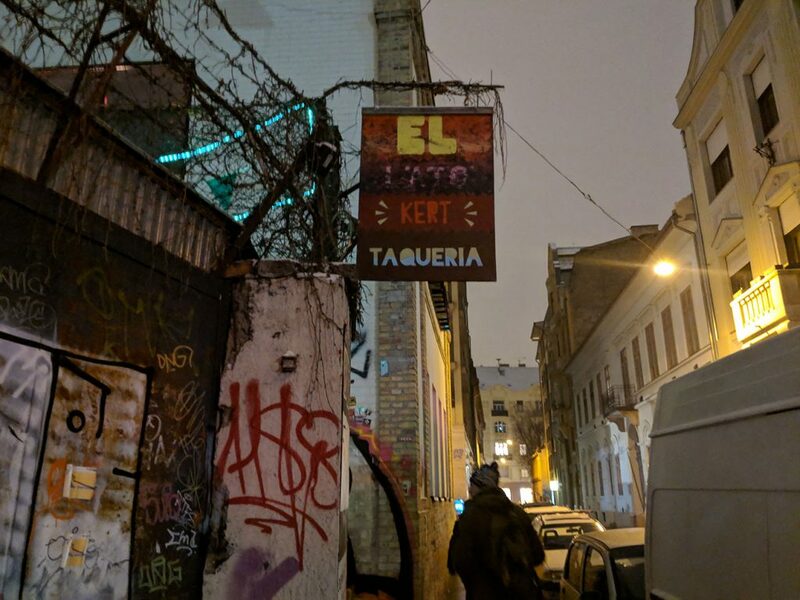 Our experience was just meh, but we’ve heard great things about Ellátó Kert. If you want our advice, go later on a weekend and try the Pinky shot! Okay, we’re going to venture out of the famous Jewish Quarter (District XII) and head into District XIII. It just so happends that our Airbnb is 6 blocks from Élesztőház. We had no idea until the last week of our stay. Sad day! 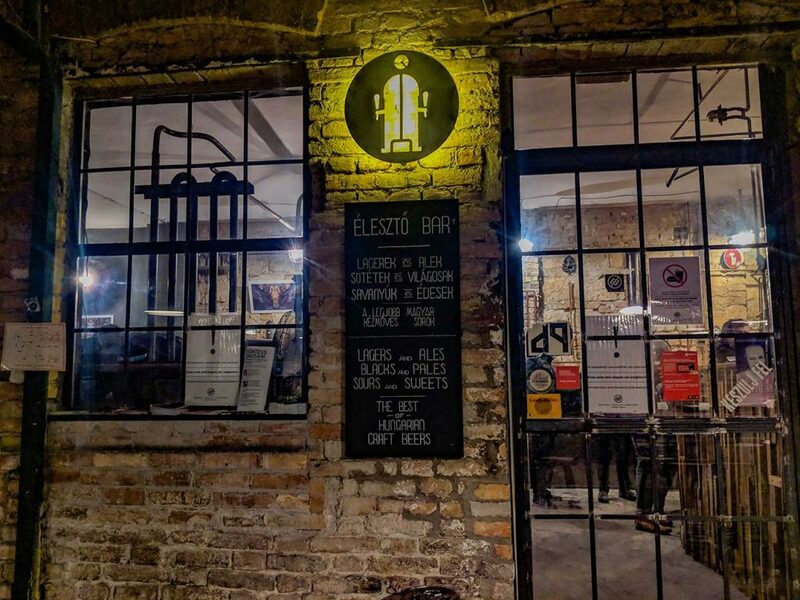 If you’re a fan of craft beer then Élesztőház needs to be on your to-do list. There are 21 Hungarian craft beers on tap and they have some amazing IPA’s! It made us so “hoppy”. Ok, that was a really lame pun. But it’s true. Situated in an old meat processing plant, Élesztőház is near the popular Corvin Plaza so don’t think it’s hard to get to. Just take the M3 (blue line) to Corvin-Negyed and you’re there in a few minutes! The place was filled with locals which gave Élesztőház a great vibe. There are so many ruin pubs in Budapest. Just start walking in the Jewish Quarter, taking in the awesome street art, and you’ll find yourself a ruin pub. The best part about there being so many ruin pubs in Budapest is that your options are endless. 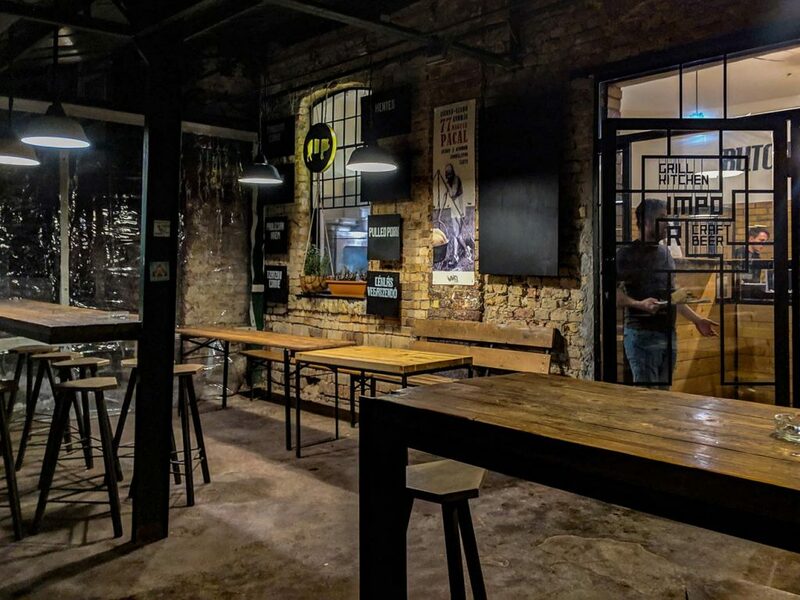 Whether you want to experience the colorful and vibrant Szimpla Kert or you simply want to taste the craft Hungarian beer at Élesztőház, Budapest’s ruin pubs have something for every traveler. I have never been to Budapest and never heard of ruin pubs. Love this concept. Have some fab food and drinks in a place oozing with history. You just can’t go wrong. Great list and photos. It’s a long time now since I visited Budapest, but although I remember exploring it by day, I can’t remember seeing much of it at night. I’d love to experience some of these ruin pubs first-hand. And that last one on the list: Élesztőház, is the most appealing of all to me. I’m a big fan of Central/Eastern European beers, so I’m definitely game for some of those craft beers. I am hooked on this! 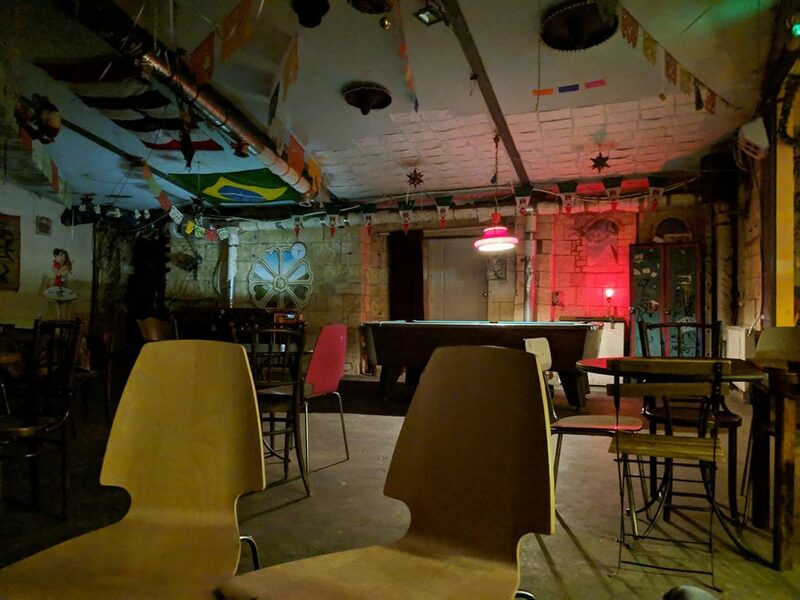 I’ve been hearing so much and seeing so many photos about the ruin bars of Budapest I simply can’t wait to return to the Hungarian capital to discover them. Great article! We didn’t spend enough time in Budapest to explore its ruin pubs…and looking at your post I’m hoping we will get a chance again sometime in the future. All of them seem to be very atmospheric and that is their USP. I had never heard of ruin bars until now. The buildings have a gothic touch and I love the decor. Mazel Tov looks pretty with all those lights. I’d to love to visit Budapest and get a drink there! I always find it somewhat amusing (in a good way) how something that grew out of a desire to NOT be trendy and buck the societal norms has, because of popularity, become, well, trendy and suddenly a major tourist draw. We have to admit that the last time we were in Budapest, we avoided many of the Ruin Pubs because they were just too, well, trendy. You seem to have pointed out a few very good local ones though … which is very refreshing. Perhaps next visit. Yas!!! My sister recently went to Budapest and discovered all the Ruin Pubs. They are fascinating and have to much character and history. Love your list and your photos are awesome! These are fascinating! I had never heard of anything like them, but what a great conglomeration of good drink, good food and fun, funky art! I love when old places get repurposed and these all look like they have some great character. Do they emphasize any of their history at all or more just focus on the craft brews and artwork? Seems to be a minor trend throughout Europe, especially Eastern Europe, to put pubs or clubs in very old dilapidated buildings. I’ve seen cool things in Slovenia, Croatia, Prague, even Malta. 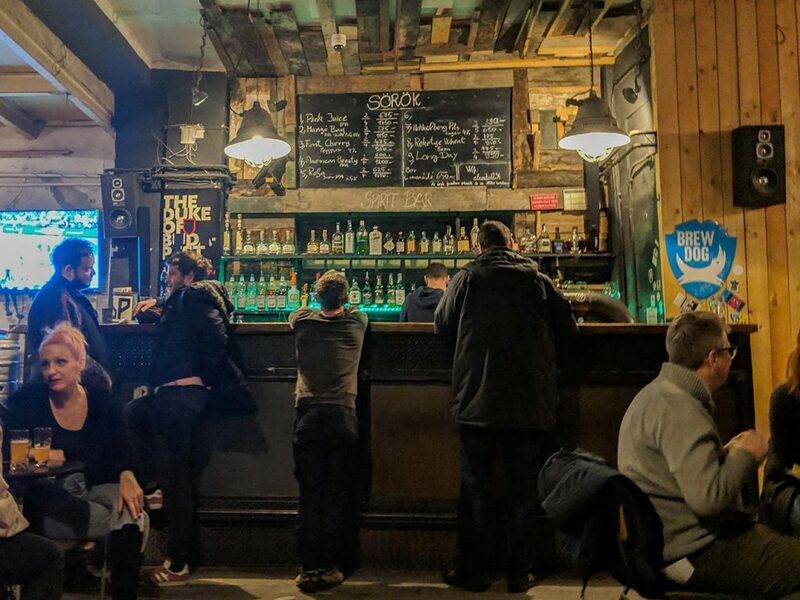 I like the ad hoc atmosphere of places like this, especially the later listings on this post, but also the way that Szimpla Kert, the first listing, is really working its setting with art. And nice photos there! We’re Darah and Garrett. Our life has been an adventure ever since we eloped in a pink Cadillac in Las Vegas. Now we’re running around the world, working online, and eating everything we can. Read more!